Lottery can be very rewarding! Lottery Pros team brings you the best lottery affiliate programs. Check these 4 fantastic user-friendly lottery affiliates, compare their offers and choose the one that suits you the best. Register for free and start earning today! 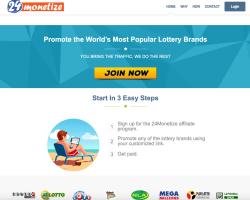 24Monetize is a new yet rapidly growing lottery affiliate program featured by 24Lottos.com, a leading lottery platform on Africa market. High player value, great conversion and retention rates are what put 24Monetize on top of our unbiased list! Let’s see its features closer. 24Monetize allows affiliates to promote the world’s biggest lotteries, such as US Powerball, USA Mega Millions, EuroMillions, etc. and receive lifetime revenue. The program offers a 24/7 tracking, allowing to follow the visual graphs of your sales, current balance and traffic in real-time. 24Monetize is a free to join an affiliate program and anyone who registers and replies to 24Monetize welcome email will be approved by the team. Once you’ll be approved, you can set up an account and launch your promotional campaign. 24Monetize.com offers a package of the modern marketing tools that will boost your campaigns. Even if you stop bringing new members, you still continue to earn from members you have already brought up. Lifetime! 24/5 support team will guide you through the process and help to resolve any issues. 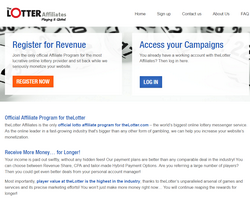 The industry pioneer in the field of online B2C lottery ticket sales, TheLotter, has its own Affiliate Program under the banner TheLotter-Affiliates.com. Affiliates are buzzing about the relatively new program by the market leader, hence it comes in second position on our list. The main reason for the interest is the high Lifetime Value of its players and the dedicated team of seasoned account managers, ready to provide round-the-clock service to maximize the effectiveness of any campaign. The program allows affiliates to promote TheLotter’s own leading lottery ticket online platform and also gain brand recognition through their popular website. This performance based marketing strategy will convert leads into money and any purchased tickets will trigger generous rewards that act as an excellent incentive. The program has no negative carryover and offers a very high lifetime value per player. There are no fees for joining the program and anyone who fills out the application form will be contacted by the team. Once the terms and conditions are explained and accepted, the new member can set up an account right away and launch a campaign without delay. Members can choose between a revenue share or CPA plan. Rev Share is preferred by most lottery affiliates as profits compound if the recommended players purchase a lot of tickets on a monthly basis. TheLotter-Affiliates.com offers unique marketing tools that include, but are not limited to banners, links, landing pages, flash tools and icons. Whenever an affiliate has a special request, the customer support will come up with on-demand custom tools and will diligently work with the member until the desired results are achieved. Payment plans are chosen after the two parties discuss both the upside and shortcomings of each method and put up a mutually beneficial strategy. Bank transfers, PayPal, Skrill (formerly known as Moneybookers), Webmoneyand Neteller are all on the table. LottoElite has a dominant position worldwide and is the lottery affiliate program of BuyLottoOnline and WinTrillions, brands that are both popular and credible. Players from all over the world have access to their service and French and US players enjoy special privileges as they can use any of these brands. The best way to ensure the success of a lottery affiliate program is by presenting players with the option of purchasing tickets for numerous lotteries. 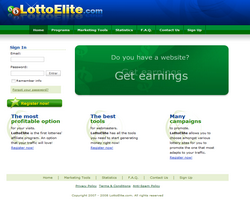 LottoElite brilliantly succeeds by incorporating some of the lotteries that awarded the highest jackpots worldwide. Check out these names: National Lottery UK, Mega Sena, Lotto 649, SuperEnaLotto, Lotto Germany, El Gordo, Loto France and New York Lotto, as they pretty much speak for themselves. Affiliates get to choose between a CPA that offers a payout ranging between $10 and $45 or the revenue share, which has values inching close to 15%. There is also the sub-affiliate option which translates into certain returns, although the percentages decrease to 3%. Affiliates decide whether they are paid through PayPal, Western Union, Payoneer or bank wire. The program is available in 10 languages, there are no countries excluded and a proprietary software is in use for enhanced safety and celerity. LottoElite makes it easy to keep track of your leads, income, sales and referrals thanks to its backend tools, charts and other statistics. Don’t forget to check out the reports tab where the most important figures are presented in a succinct manner to get your facts straight without unnecessary delays. As for marketing tools, affiliates can rely on a comprehensive collection of banners, in both graphic and flash format, a plethora of lottery reviews and text ads. Those who know how to work with links, RSS feeds, iframes and other I-frame tools are in luck because LottoElite offers them all. On the off-chance that you don’t know how to tackle the challenge or want to find more about these tools, the customer support is always just one click away. Online gaming is more popular than ever and lotteries stand out from the crowd in terms of the number of people who play the games regularly. LottaRewards is an affiliate program that makes it possible for visionary people to make a nice revenue exclusively by tapping into the immense potential of lotteries. An affiliate program regardless of nature is just as good as the commissions it offers, and this is one of the best selling points of LottaRewards. For starters, it is free to join, which means that there are no strings attached for those who want to jump right on the bandwagon. The decision between revenue share model and CPA has never been easier with the former offering commissions that go all the way up to 25%. As gaming affiliates go this level is unmatched and the best thing is that these commissions don’t depend on profits but are based on sales. 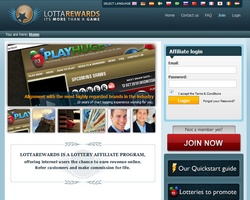 LottaRewards is also the go to affiliate for players’ incentives and promotions, as it uses the established website PlayHugeLottos.com. There is no better way of showcasing your brand and turning leads into serious cash than by shaking hands with these guys. Nobody said that an affiliate needs to be a savvy programmer or to have advanced skills for what it matters. That’s why the WordPress plug-ins and widgets are user-friendly and they do a great deal at generating lucky numbers for lottery draws. The ultimate beneficiary of these plug-ins is the user, which is provided with more freedom in choosing his favorite numbers. All of these plug-ins are free to download and the most popular ones go by the name of the lucky numbers creator and random numbers creator. The first is a highly versatile one that should be added in the sidebar, while the second was designed for posts and pages.